SME supplies high-ambient cooling, temperature control, HVAC units and solutions; portable and fixed electrical houses, and substations; design and establishment of production lines; as well as continuous plant upgrades. SME’s integratable air-conditioning units (aircons) are designed to operate in adverse conditions, providing reliable cooling for industrial enclosures with high-temperature environments of up to 65°C. Optional features make the units versatile and the structures are easy-to-maintain, with all spare parts readily available. SME offers custom air-conditioning solutions for mining vehicles operating in temperatures up to 55°C. Mine vehicle aircon units are developed to be reliable in high-temperatures and humid, dusty environments, and able to withstand shocks and vibration. All SME temperature control units are performance tested in SME’s climate-control room. The equipment is also vibration and EMC-tested, where necessary, to ensure optimum performance and compliance with the relevant specifications and procedures. SME offers climate-control rooms with electrical houses (E-houses) or substations, designed to meet clients’ carbon footprints. The large, movable compartments are custom-built to last for 30 years* in extremely adverse environments and are ideal for housing electrical switchgear panels (*enclosures are manufactured to SS316, SS304 or 3CR12). SME’s HVAC solutions for plants and buildings are offered as normal packaged and split units, chiller solutions, and thermal ice and hot water storage systems. The company supplies the latest technologies for plant upgrades, including robotic grabs for material stacking, unmanned shuttle cars for material transfer, trailer solutions for distributing parts in production lines and mobile and fix platforms for production assembly lines. SME’s air-conditioning units are available in 1.5kW to 20kW powers and operate in ambient environments up to 65°C. Units can be equipped with a fresh air supply for operator comfort and well-being. The aircons remove harmful chemical vapours from the air, such as tear gas, fluorides and sulphides, as well as coarse and fine dust particles and any corrosive agents. The controller enables communication via Bluetooth to smartphones when setting-up and for diagnostic analysis, and is fitted with a CANBUS industrial network interface. SME custom-designs in-vehicle air-conditioners to match the vehicle’s purpose, for example, cabin evaporator designs include fitment options for under seats, against side walls, recessed in floor, roof-mounted and integrated in the driver’s console. Aircon form and fitment are adapted to interface with ducting, diesel burner air heaters and chemical filtration modules. Condensers can be integrated with engine cooling packs or packaged as bolt-on modules. Typical standard capacities are up to 20kW to achieve 22°C cabin temperature in a 55°C ambient environment. SME uses high-efficiency scroll compressors and effective capacity control, in accordance with the load. Heating can be supplied by evaporator-integrated elements, separate heating or reverse-cycle heat pump design. E-houses provide a reliable, dust-free, IP65 climate-controlled environment for a wide variety of equipment such as variable speed drives (VSD), switchgear and auxiliary power units. E-houses are designed for very corrosive and highly ambient conditions up to 65°C. Ruggedised air-conditioning units can be designed specifically for operations in coastal and highly corrosive environments. Low-maintenance, over-pressure modules prevent dust contamination by using a self-cleaning primary cyclone filtration system that removes more than 90% of dust particles. Secondary carbon, media and Hepa filters may be added. SME ensures its E-houses meet clients’ safety standards with design options such as removable roofs, fire prevention and suppression systems, false flooring for cable routing and doors equipped with panic escape equipment. SME uses CAD to develop the company’s mechanical, electrical and electronic designs into innovative products. The company strives to provide cutting-edge solutions to a variety of industries by using the latest CAD modelling, finite element (FEA) and flow analysis (CFD) software packages. Specialist Mechanical Engineers is an entrepreneurial and innovative company committed to supplying quality solutions on time. The company has achieved success through the diversification of its services, as well as building strong, talented and hard-working teams comprising of project managers, engineers, technicians and quality control representatives. SME supplies a high-velocity clean air booster to cool and ventilate electronic enclosures. The cyclone version of the air booster provides fresh, dust-free air for the comfort of workers. Specialist Mechanical Engineers supplies a range of air-conditioning panel coolers, such as the compact and lightweight MK150. 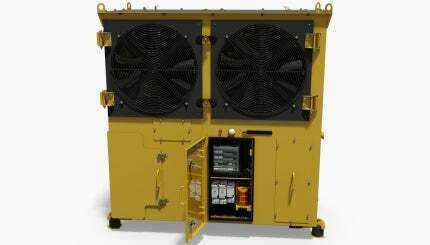 SME offers clients the MK450 air-conditioner to cool industrial enclosures in very high-temperature environments.